Interesting in the fact that it was designed for having it's treads removed, and it would become a very fast tread-less tank (moving at speeds around 85 km/h almost) - more like a Puma tank really (operating at 90 km/h), hence why the special rule I gave it - something quite experimental if you prefer. The wheels actually were rubber lined, so they could immediately operate like wheels - they would have traction with the ground. However, this idea did not turn out to be as good as it promised itself on paper - realistically no one would bother taking off the treads anyway, it was a waste of time and putting them back on took time - not the very best if you bumped into an enemy and need to go to combat mode immediately. But to make it game-wise interesting, I gave the "Treadless moves" rule, just to give it an extra little twist really. 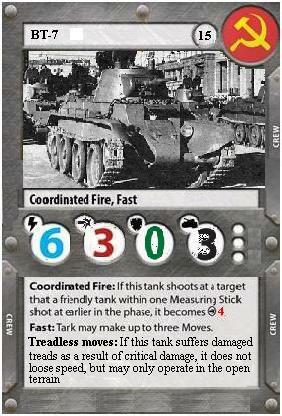 It had armour similar to a Crusader MkIII, so that was used as a base, decreased firepower, due to the 45mm being less powerful than the 6-pdr on the MkIII Crusader (from the existing cards out there), but a firepower of 2 would really edge it in one category of stuff like 37mm guns or similar, much weaker than the gun it actually had, so it should be between 2 and 4 - making 3. Would be interested to hear critical remarks and play-tests if any interest bothers you with this one. As always, it is not the big stuff that interests me, but the humble little stuff that for some odd reason get ignored mostly. I think it is a common attribute I could almost call "giganitsmos-philia" not to say that I don't have the bug.... really love the Maus.... anyway, side tracked, I am again. I like it! I really like the early war stuff and have a Zvezda BT-7 waiting to put together and paint. And of course very interested in seeing what you come up with for the BT-42. As for any critical thoughts, like you said valuing realisticity I read recently it took 30ish minutes to convert from tracks to wheels (so for simulation fans out there perhaps not a house rule to be used), but for a friendly gameplay mechanic I love it. I'm not sure about the points cost, maybe a little high, but with the good attack score and traits that could be about right. As always thanks for sharing what you've been coming up with so far! Cheers for the comment there OCDPaul, and nice to see you on-board here. Yep, I was well aware of the "inaccuracy" of my house rule, and the chances that both treads will be blown off without damage to the lightly armoured tank so that it could start whizzing off like a fast truck is frankly speaking very slim, almost zero and the game simulates too short of a time to take the tracks off. But I just wanted to try to have every tank that I create have something special about it that would make it interesting in terms of game play, if it is possible (e.g. T34/76 wasn't able to be special in any way really), since my plans for creating a T-26 and a CV-33 have stalled because of that for the moment - they would just simply not be usable in terms of game play, at least from what I can see here, and would be really heavily scenario based things. So yep, this is up to the players really if they don't want to use this rule, I think simply deduct 2-3 points or something around that, since it becomes an "under-powered" crusader sort of thing.